The Wabbit took Robot to the place he now called Pluto Park. It was Ghost Bunny's favourite place to haunt and the Wabbit knew he would always find Ghost Bunny in that vicinity. "Who's your friend?" fluttered Ghost Bunny as she swooped very close to Robot. "Frighteningly yours," she moaned and came to a sudden halt. 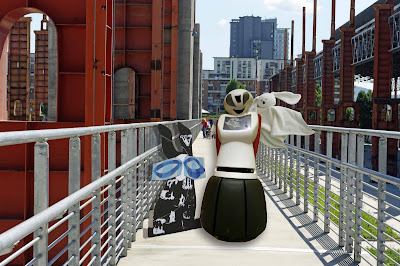 "You'll be looking after Robot for a while," said the Wabbit. "A delight to meet you Miss Phantasm," said Robot. "Ms" said Ghost Bunny. "Pardon me," said Robot. "Forgiven," said Ghost Bunny and then she spoke enquiringly. "I do like you, Robot. What is your general framework?" "Neural," said Robot. "And your memory?" asked Ghost Bunny. "Positronic," said Robot. "Ooooooh," sighed Ghost Bunny and she drew closer. "Do you by any chance have buttons?" she asked in a low voice. "Plenty, said Robot, "but they're hidden." "Don't let the Wabbit touch your buttons," whispered Ghost Bunny. "Why not?" said Robot in a hushed tone. "He does seem quite the Wabbit with circuitry." "Ah!" said Ghost Bunny. "Where the Wabbit and buttons are together, drama always ensues." "I can't hear you. What are you talking about?" asked the Wabbit. "I was just saying that Robot should come to our chummery," said Ghost Bunny. "What on earth is a chummery?" said the Wabbit. "It's a place where chums are billeted together," said Ghost Bunny. The Wabbit shook his head for a while. "And you may not push my buttons," said Robot suddenly. Ghost Bunny flinched and cowled her eyes. "You have buttons!" exclaimed the Wabbit.